In preparation for the 75th Anniversary, the southeast plaza on the San Francisco side of the Bridge has been revitalized, improving the experience for the millions of people who visit the Bridge each year and reflecting the natural beauty and historic significance of this world-class destination. The Golden Gate Bridge, Highway and Transportation District has also undertaken various construction projects that affect bicyclists and pedestrians visiting the Bridge. The Golden Gate Bridge, Highway and Transportation District is partnering with the Golden Gate National Parks Conservancy and National Park Service on the gateway enhancements. Bridge Round House. The historic Round House, which overlooks the Bridge, is now the staging area for personally guided Bridge tours and home to the new Bridge Photo Experience, offering visitors a way to create a lasting memory of their trip to the Bridge, even on the foggiest days. Bridge Plaza. Revitalization of the plaza offers more space for gathering and improved circulation, restored historic views, improved signage, parking and trail connections, and reflects the landmark status of the setting. Bridge exhibits, developed with funding from the National Science Foundation, are also installed in the area. 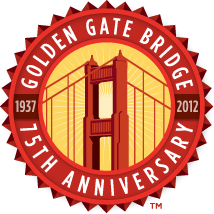 For information about the bricks from the 50th anniversary of the Golden Gate Bridge, please click here. Bridge Pavilion. The first on-site center dedicated to telling the stories of the Golden Gate Bridge is now open daily from 9 am until 6 pm. The 3,500 square foot Bridge Pavilion welcomes visitors, provides orientation and information services, houses exhibits, and offers high-quality commemorative and interpretive merchandise. Bridge Café. The pre-existing café has been upgraded and a new menu features healthy, sustainable, and local food options. Open 9 am to 6 pm. Trail and Overlooks. Complementing the Bridge plaza enhancement are improvements to segments of the Coastal and Bay Trails near the Bridge. Two new overlooks, on the west side of the Bridge, provide dramatic viewing points for visitors. The gateway improvements are consistent with the 1994 NPS General Management Plan Amendment for the Presidio, the approved Presidio Trails and Bikeways Plan, and the Presidio Vegetation Management Plan. Each tower contains 21,500 tons of steel, weighs 44,000 tons and supports a 61,500-ton load from the main cables.